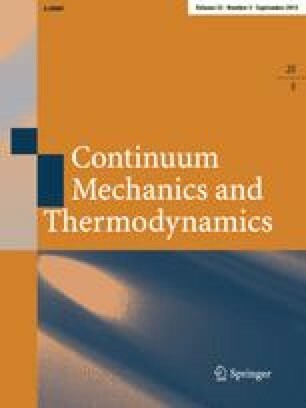 This investigation is directed toward understanding the role of coupled mechanical and thermal effects in the linear stability of an isothermal antiplane shear motion which involves a steadily propagatingnormal planar phase boundary in anon-elliptic thermoelastic material. When the relevant process is static — so that the phase boundary does not move prior to the imposition of the disturbance —it is shown to be linearly stable. However, when the process involves a moving phase boundary it may be linearly unstable. Various conditions sufficient to guarantee the linear instability of the process are obtained. These depend on the monotonicity of thekinetic response function — a constitutively supplied entity which relates thedriving traction acting on a phase boundary to the local absolute temperature and the normal velocity of the phase boundary-and, in certain cases, on the spectrum of wave-numbers associated with the perturbation to which the process is subjected. Inertia is found to play an insignificant role in the qualitative features of the aforementioned sufficient conditions. It is shown, in particular, that instability can arise even when the normal velocity of the phase boundary is an increasing function of the driving traction if the temperature dependence in the kinetic response function is of a suitable nature. The instability which is present in this setting occurs only in thelong waves of the Fourier decomposition of the moving phase boundary, implying that the interface prefers to be highly wrinkled.